EvoJazz is a musical toy that amplifies your own natural musical creativity. It is currently available for the Android Platform. You may not know music theory or even how to read music, but you know what you like. That's all you need to get started creating music with EvoJazz. Here are some screenshots to explain what the program is about, and how to use it. 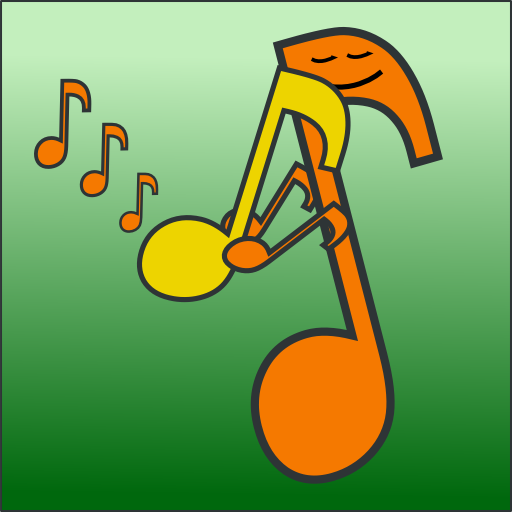 EvoJazz shows lists of musical phrases. You can quickly tap one to select and play it. 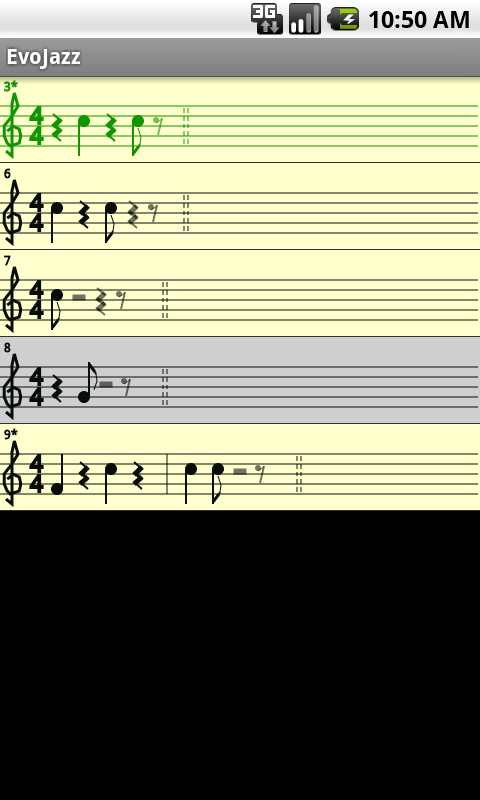 Phrase #3 is selected above as indicated by the shading. If you press and hold an item, you will get a new list of variations on it. This is a list of variations for phrase #3. Use the menu key to get a menu. From the menu, you can play a puzzle and do other things. The puzzle menu item plays a musical phrase from the list you have up. Then you can pick a list item and see if it is the right one. You can keep guessing until you get the matching musical phrase, or you can just give up and do something else, or ask for a new puzzle. The puzzle is a fun way to improve your ability to read music and train your ear. If there are phrases that have only rests, the puzzle phrase played may just be silence. 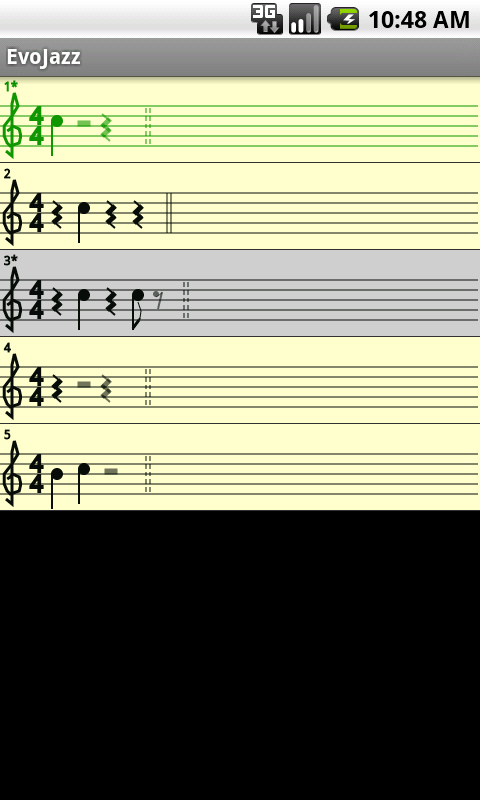 You can change options about what instrument to play the music in, what key signature to use for generating new phrases, and how much to vary notes when variations are made. 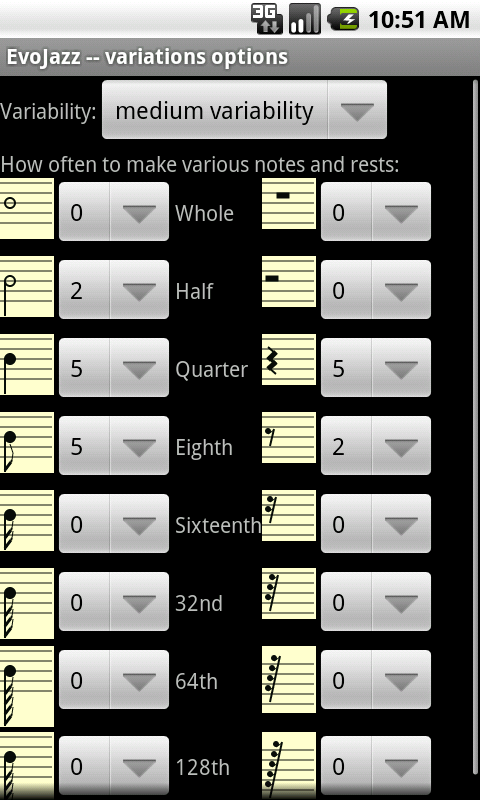 On this preferences page, you can adjust how frequently notes of different durations are generated. You can go back and browse through the phrases that you generated. 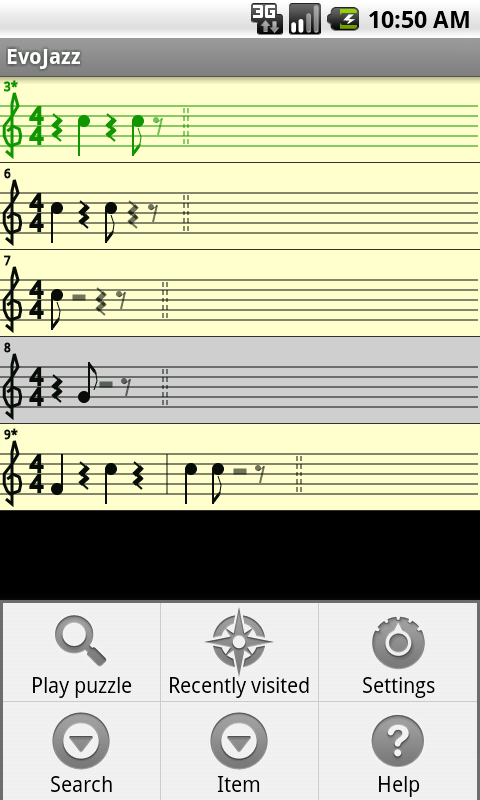 You can also give titles to musical phrases you like. You can tag them and then search for the tags. 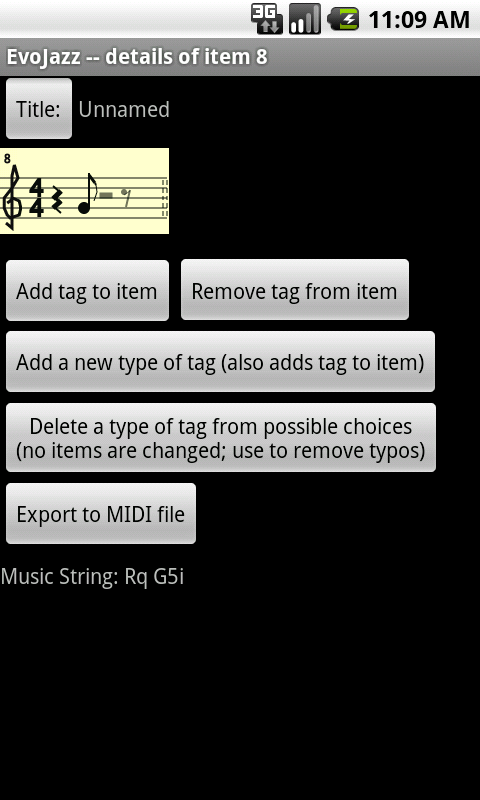 You can also export them to MIDI files, perhaps to use as a ringtone or import into other music software. 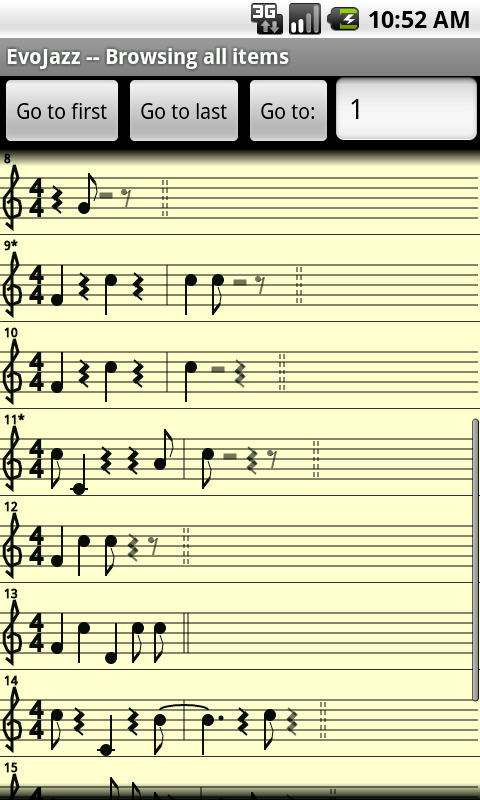 Here is a sample midi output file. For technical support or other questions, please email support at evojazz.com. EvoJazz is a project of ArtificialScarcity.com. As mentioned there, approximately three calendar years after a major version of the software is released, the developer intends to make the source code for that version available under a version of the GNU GPL free software license. However, any related trademarks (including the product name) will remain under the control of the developer. Thank you for your support in the meanwhile.